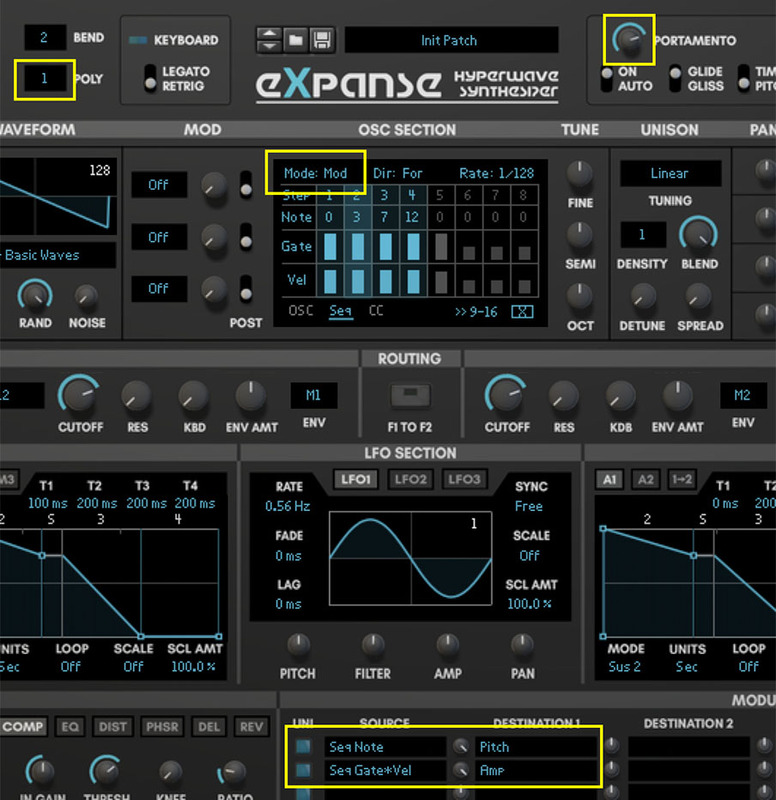 The sequencers in Expanse allow you to go deeper with sound design. The Note Sequencer is great for arpeggios and Matrix style patterns. 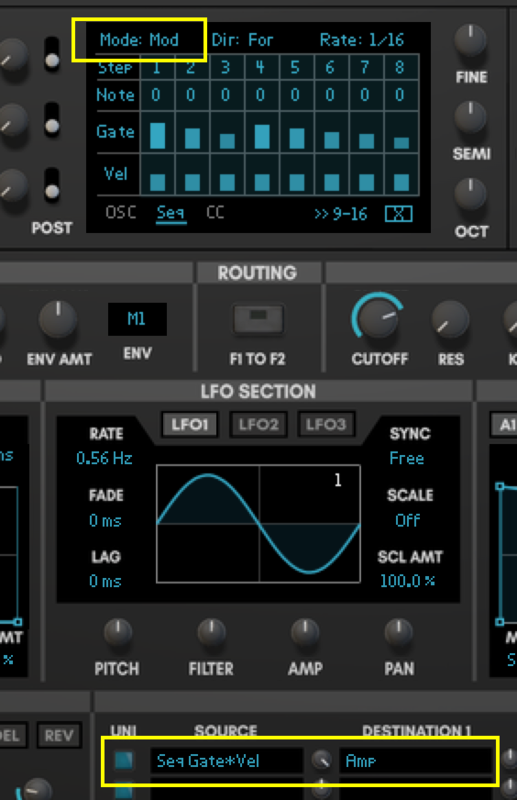 The CC Sequencer allows you to create flexible modulation and custom LFOs. With a few tricks in the Mod Matrix it’s possible to do some other fun things with the sequencers. You may be used to sequencers that are monophonic, they just play a set pattern of single notes. With Expanse’s Note Sequencer, you can play chords in a pattern as well. All you have to do is leave the notes set at 0 and create your pattern, then play a chord on the keyboard. Instead of triggering notes like usual with the sequencer, setting up a trance gate allows you to create patterns in the output volume of the synth. It can allow chopped segments of sound to come through similar to the Alligator effect device. It’s easy to set up. Connect Seq Gate*Vel to Amp in the Mod Matrix. That means the gate signal from the sequencer will control the output volume. In the sequencer, set the mode to Mod. In Mod mode, the sequencer output goes to the Mod Matrix but doesn’t trigger notes. And that’s it, you have a trance gate! Now you can create cool patterns. If you use the sequencer to trigger notes like usual, the envelopes retrigger and portamento glides on each step of the sequence. You might not want that. It is possible to only sequence the pitch and volume, all you need is some simple routing in the Mod Matrix. In this example, we’ll make a very fast arpeggio chiptune sound. Once again, we’ll use the Mod mode so that the sequencer doesn’t trigger notes. In the Mod Matrix, route Seq Note to Pitch and Seq Gate*Vel to Amp. You need to turn the amount up all the way for the Pitch destination. Now the sequence affects pitch and volume. To create a chiptune sound, turn the sequencer rate very fast, like 1/128, with an arpeggio pattern. To allow the portamento to work, set the polyphony at 1, and turn up the portamento knob. Now you know about Mod mode and the Note and Gate*Vel sources. Have fun experimenting!